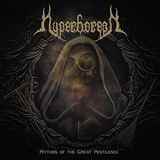 Once I was notified that Swedish Hyperborean have a new album out I was drawn (as well as prompted by the band themselves) to check out whether the old, turn of the century, Hyperborean made a return, or the new Hyperborean, the one born on The Spirit of Warfare, continues to live. Alas, Mythos of the Great Pestilence proves that there will be no old Hyperborean resurrection, there will be no old demos folk-tinged melodic death/black going forward. Instead, Hyperborean will continue down the pathway of sharply executed, but pretty biting, clean sounding black metal. At the same time, getting prepped for Mythos of the Great Pestilence I re-listened to The Spirit of Warfare again, and the thought crept into my mind that I might have been a little too critical in my 3-yr old assessment of that album. After all, there were epic length songs and melodic moments of The Last Stand of Leonidas and the Battle of Thermopylae, harmonized keyboards of Weapon Mankind, fantastic layering of The Sick Man of Europe. Equipped with Devo (Marduk) at the mastering controls, Mythos of the Great Pestilence is now even more focused on lunging for the throat savage riffs (Hail Dystopia), often prevailing blasting, vocals ranging from harsh screams to bottom of the pit bellowing, as well as long, complex, non-linear song structures (The Great Pestilence). In other words, while there is no return to the Gothenburgian past, there also was no shift to raw lo-fi black metal either. Hyperborean continued honing their craft and their musicianship, utterly enlisting themselves with the likes of Naglfar, Necrophobic and gentler and more progressive sounding Marduk (no wonder Devo is here). There are still some cuts on Mythos of the Great Pestilence where brutality rules outright and I still can’t get into these songs, no matter how many times I tried (Bring Forth the Dead Man). There is no slowdown in the barrage, no respite and not much folk, despite the Swedish title of Anglamakerskan Hilda Nillson. But the cool sweeping melody around 4’ in this cut, poking its face through the blast is what I have learned to find on Mythos of the Great Pestilence, and once I was able to, many of these compositions became enjoyable. The shreds of such melodic moments are cleverly buried and interspersed in Hail Dystopia, and Hyperborean have the knack of taking their melodies in some of the unusual directions (Ethics of the Conqueror), so I can see how avant-garde black metal label can apply here, although one would never confuse Hyperborean with Ulver. The doom/hell immersion at the beginning of The Slaves of This World is a welcome change of atmosphere, blasting still drilling holes in the listener’s brain later on. On the Nature of Mankind has strong riffs, and fantastic sense of harmony, just like The New Paradigms Outcasts, the opening riffs of which suggest some folk influences. The New Paradigms Outcasts is also the only cut on Mythos of the Great Pestilence I can hear some synth presence on and the layering similar to The Sick Man of Europe from The Spirit of Warfare. As you can see from the song titles, the topics of war and other disasters befalling mankind are still of major interest to Hyperborean. Many kvlt black metal fans often tend to dismiss Swedish school where death metal rigid rhythms and clean high quality production are present. Well, Hyperborean have all that, but they are also excellent musicians, the solos and sweeps on Mythos of the Great Pestilence being just one testament to the fact. I will allow myself to quote Mythos of the Great Pestilence perhaps a few points higher as I normally would have, as a restitution moment of underquoting The Spirit of Warfare. Both albums deserve your attention.